I am retired from private practice. What insurance coverage do I have under the primary LSO program? You have Run-Off coverage of $250,000 per CLAIM and in the aggregate, subject to a $5,000 DEDUCTIBLE per CLAIM, and subject to any prior CLAIMS for which notice was provided while on exemption. This coverage is a one-time limit and is not re-instated annually. Run-Off coverage applies only to CLAIMS arising out of PROFESSIONAL SERVICES provided while you were in private practice or maintained the full ongoing practice coverage. That is, you are covered to a maximum of $250,000 for all of the CLAIMS made against you while exempt, including the year you leave active PRIVATE PRACTICE, past years in which you were exempt, and all future years while exempt (except for LAWYERS eligible for the mobility exemption). Run-Off coverage does not provide coverage for CLAIMS arising out of PROFESSIONAL SERVICES that you provide while exempt from paying the insurance premium. The only exceptions to this are with respect to PRO BONO SERVICES provided through an approved pro bono program associated with Pro Bono Ontario, and where you have applied for and purchased additional coverage specifically for certain ongoing services as estate trustee, trustee for inter vivos trust or attorney for property. Ontario LAWYERS who are exempt may apply to increase their Run-Off coverage limits. For further details, refer to the Insurance Matters for Retired Lawyers booklet. 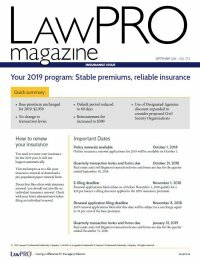 Do I have to buy additional Run-Off coverage through LAWPRO or can I buy it elsewhere? You do not have to buy any optional insurance coverage through LAWPRO. You are free to buy your run-off insurance from the insurer of your choice. I’ve decided to buy up my Run-Off coverage limit to $500,000 for five years. Is the $250,000 Run-Off coverage still there for me after five years, even if LAWPRO pays out more than $250,000 in CLAIMS between then and now? No. If CLAIMS made against you exhaust the $250,000 Run-Off coverage and you do not apply to renew your limit buy-up after the five-year term, you will have no coverage in place for any future CLAIMS that may be made against you. I am retired but occasionally provide PROFESSIONAL SERVICES to my family and friends. Am I covered under my Run-Off Coverage or do I have to buy insurance coverage? If you plan to continue providing PROFESSIONAL SERVICES in private practice, even on an occasional basis or on a pro bono basis to family or friends, you must obtain the practice coverage under the primary LSO insurance program. I have just been retained on contract to act as in-house corporate counsel for an organization. Am I exempt from having to pay the insurance premium? Whether or not you are exempt depends on the terms of your present employment. You must be employed by a single employer providing PROFESSIONAL SERVICES only to the employer, as well as any affiliated, controlled or subsidiary companies. However, if your contract requires that you provide PROFESSIONAL SERVICES to your employer’s customers or clients, you are deemed to be providing PROFESSIONAL SERVICES in private practice and must pay the insurance premium. Generally, contract employees who work on a fee-for-service basis and/or work irregular hours are not eligible for exemption. Please contact LAWPRO for assistance in determining your eligibility. I am an employed LAWYER in a major LAW FIRM but do only legal research. Would I qualify for an exemption from having to pay the insurance premium? Whether or not you qualify depends largely on the nature of your work product and who is likely to see or use it. If you work in a firm environment and do legal research exclusively, do not provide any legal opinions but merely a statement of the law, do not meet or correspond with any firm clients, and if none of your work is provided to clients or others outside of the firm, you are in LAWPRO’s opinion acting as a resource only to the LAW FIRM LAWYERS and would qualify for an exemption. If you provide freelance work to one LAW FIRM or more, you will require coverage. Most LAWYERS who provide research services do provide opinions that are subsequently provided to clients of the LAW FIRM. These LAWYERS are considered to be practising law and are required to pay the insurance premium. I’m currently an exempt LAWYER. What insurance coverage do I have under the primary LSO program for any pro bono work that I do? See our page on providing pro bono professional services. I am a LAWYER currently on exemption (e) because I act as in-house counsel. I will be taking a temporary leave of absence from my job next month. Can I claim exemption (c) which is available to LAWYERS who are on a temporary leave of absence? Exemption (c) is only available to a LAWYER who is insured under the primary LSO program, and is not available to LAWYERS currently on exemption (a), (b), (d) (e) or (f). I act as in-house counsel and therefore am claiming exemption (e). However, my employer now wishes me to provide legal advice to the company’s clients. Can I maintain my exemption if I provide legal advice to my employer’s clients? If you were to provide PROFESSIONAL SERVICES to your employer’s clients, this would fall into the category of third party legal advice and you would need to have the practice coverage in place under the primary LSO program. You may qualify for the Part-Time Practice Option, which provides for a 40 per cent premium discount. As corporate counsel, these criteria would apply only to the PROFESSIONAL SERVICES you provide to unrelated third parties. If you are currently on exemption (e) and wish to apply for practice coverage under the primary LSO program, please complete a New Applicant Application form.